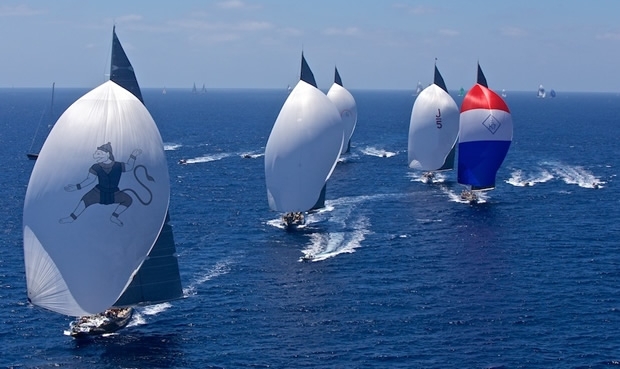 There was some spectacular sailing enjoyed by all on the second day of the battle of the Js at the Superyacht Cup. The start of racing, timed to coincide with the arrival of the sea breeze, was much the same if a little lighter and shiftier than yesterday. The Js started after the Superyacht fleet just before 1400; this would be the second of their windward-leeward races and was just as closely contested. Rainbow and Hanuman were quick off the start with Hanuman taking the lead around the three lap course for another bullet. It was tight again with only 5.5 minutes elapsed time splitting the fleet over the 2 hour 10 minute race. The positions remain the same after time correction: Hanuman, Lionheart, Ranger, Velsheda and Rainbow; these are also the current cumulative rankings after race 2. The third race on Friday will be a coastal course, to challenge the crews around the Bay of Palma. The bringing together of the Js is akin to bringing together old friends, the majority of race crew on the yachts have participated in other campaigns past and present such as the America’s Cup and the Whitbread/Volvo Ocean Race, and are genuinely enjoying the opportunity to compete on the almost level playing field that the J Class has to offer. It is recognised that to sail one of these machines successfully “you need to treat it like a race boat, not like you would a superyacht”, echoed not only in the calibre of crew on board but also in the fact that the ’s have their own class within the event following a fleet racing format. “Seeing five Js on the dock is a fantastic sight. Just imagine what it would be like if we could fill the entire pontoon” said one crew member this evening.